Pycnoporellus alboluteus (Ellis & Everh.) Kotl. & Pouz. Ceska Mycol. 17: 174. 1963. 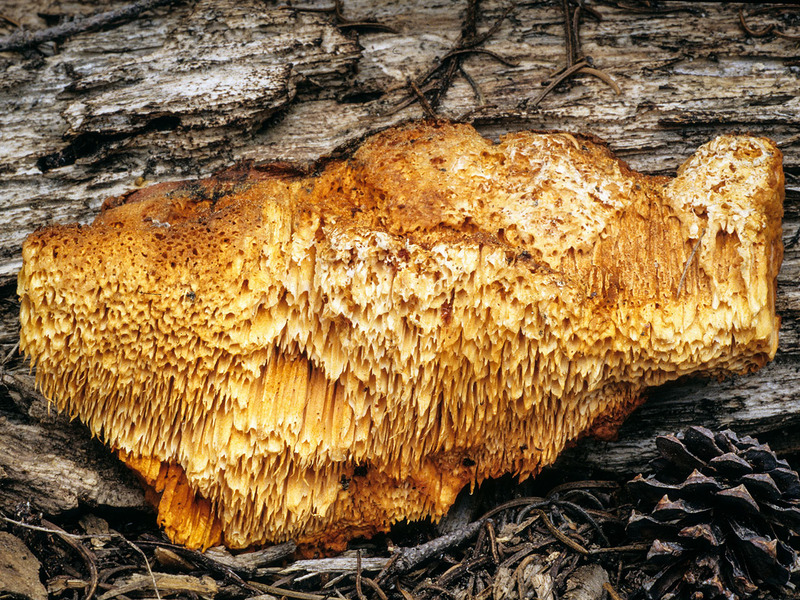 Fruiting body annual, sessile, effused-reflexed, shelving, up to 15.0 cm in length, up to 3.0 cm in width; upper surface very thin, pale tawny-buff to apricot orange, covered with appressed hairs, reddening in KOH; odor pleasant, slightly fragrant; taste untried. 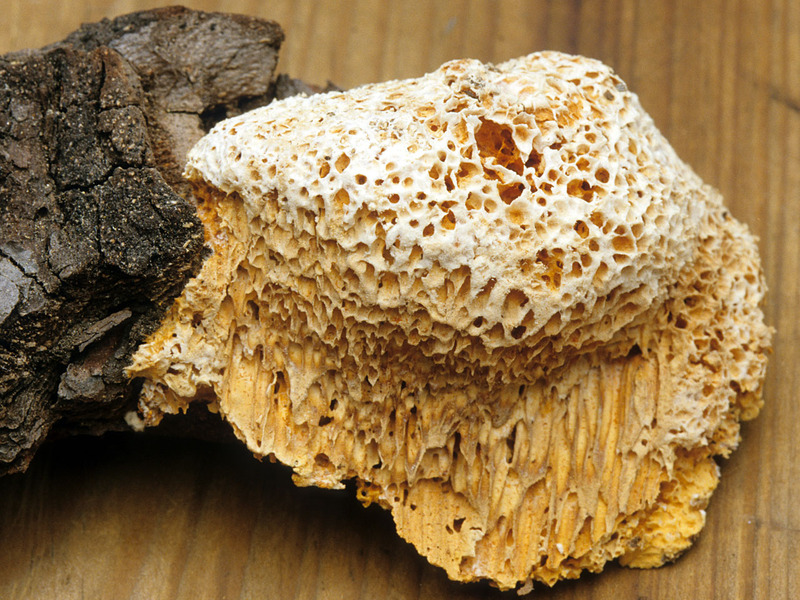 Pores 1-2 mm in diameter, round, elongate, to angular, the mouths becoming torn, often tooth-like in age; tube layer up to 7.0 cm thick, the surface apricot orange, reddening in KOH. Spores 9-13 x 3.0-4.0 µm, narrowly oblong-cylindrical in face-view, slightly allantoid in profile, smooth, thin-walled, hilar appendage conspicuous, inamyloid; spore deposit not seen. Mostly solitary on logs of montane conifers; fruiting in the spring after snow-melt; dried fruiting bodies persisting into mid-summer; occasional. 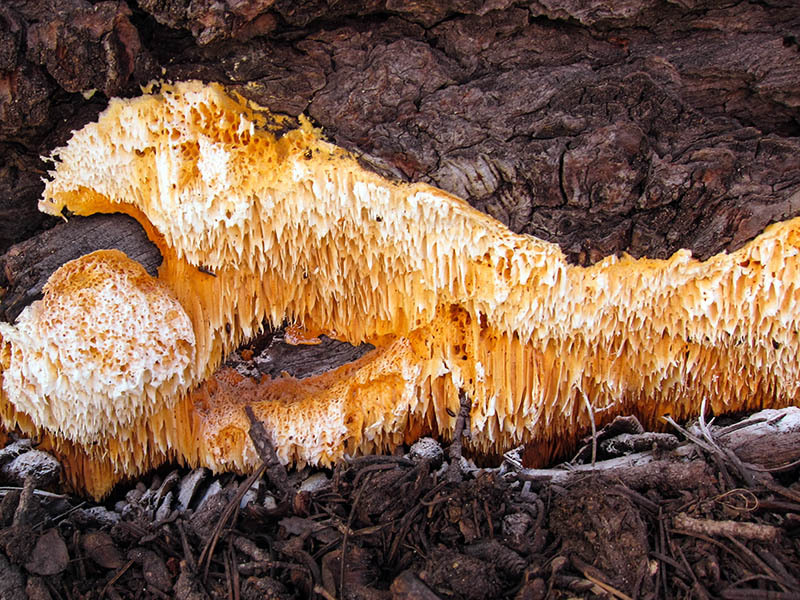 Pycnoporellus alboluteus is a distinctive and conspicuous snowbank species recognized by a buff-orange, fruiting body and pores that become tooth-like in age. It shares its preference for conifer wood near melting snowbanks with another often abundant polypore, Postia leucospongia. The latter is distinctive with a whitish, cottony upper surface that partially encloses the pore layer. Bernicchia, A. (2005). Polyporaceae s.l. (Fungi Europaei). Edizioni Candusso: Alassio, Italy. 807 p.
Gilbertson, R. L. & Ryvarden, L. (1987). North American Polypores, vol. 2. Fungiflora: Oslo, Norway. 452 p.
Ginns, J. (2017). Polypores of British Columbia (Fungi: Basidiomycota). Province of British Columbia: Victoria, BC. 260 p.
Overholts, L.O. (1953). The Polyporaceae of the United States, Alaska, and Canada. University of Michigan Press: Ann Arbor, MN. 466 p.